I used to say “Give Back” was one of the key concepts of the Maverick Entrepreneurs philosophy. (Hell, it says so right here on the cover of my best-selling 34 Rules for Maverick Entrepreneurs book. “Make More Money, Have More Fun and Give More Back”). I’ve now realized this isn’t quite right. With my background as a copywriter, I’m pretty careful about most of the words I choose. It’s your words (and even your internal dialogue) that have a tremendous impact on how you think, feel and behalf. By saying the words ‘giving back’ this implies entrepreneurs, like us, have taken something. 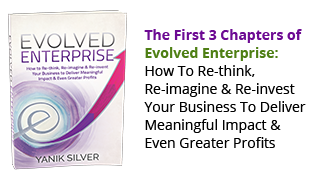 I assert that entrepreneurs and businesses can only succeed by providing and delivering value. Period. End of story. It’s simply a universal law. In fact, one of my core values in my very first journal said, “I get rich by enriching others 10x – 100x what they pay me in return.” There’s no other way that it could possibly occur because, in the long run, the marketplace is always self-correcting. The notion of ‘giving back’ seems to echo an undeserving indebtedness or even guilt for success. Should you begrudge entrepreneurs like Steve Jobs, Richard Branson or Bill Gates for their wealth? At our core, entrepreneurs are simply growth-oriented innovators and value creators. They almost can’t help themselves. Take Bill Gates for instance. Aside from his impact on micro-computing, his greatest contribution going forward will be around the Gates Foundation eradicating disease and driving new educational initiatives. And he’s not alone. Other billionaires are not content to just “give back”. They’re giving forward by applying entrepreneurial talent, energy and capital to solve some of the biggest issues facing the globe. But you don’t have to be at the level of a Gates or Branson to make a difference. Today, a group of 21st century maverick entrepreneurs are leading the way to change the way business is played and even the rules by which we keep score. Who says it’s only about one measurement on your P&L? Look at TOMS shoes. Yes, they’ve been the poster child for creative impact with their “Buy One, Give One” initiatives but it’s for good reason. They’ve created a powerful (and profitable) business model tied directly into doing something that will have a significant impact. And the best part is their customers, retail partners and vendors want to help spread that story driving increased sales. Your business can actually flourish because incoming research is proving customers are favorably disposed to doing business with you if there’s an added bonus of philanthropy “baked” in. In fact, I’ve directly seen results of split tests with one of our Maverick1000 members showing a 10% increase in sales because $50 from every sale went to a charity featured. Not only do they sell more products but the cause involved get additional support and exposure. Entrepreneurs are the lifeblood of growth, adding value and solving many of the problems we’re encountering on a local or global level. I believe it’s time for a growing group of committed leaders to come together and create a compound effect for positive change from little, maybe even tiny investments. That’s the idea for a new movement we’ve co-founded with an initial group of highly regarded entrepreneurs and thought leaders called “3% Forward”. 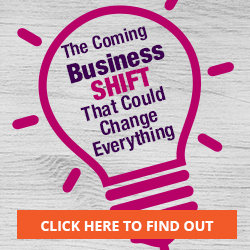 The big idea is to designate 3% of your annual sales as your “giving forward” pledge goal. Your 3% can be provided in any combination of money, talent and/or product or service for a cause that matters most to you. It might be a innovative non-profit in education, healthcare, the environment or even investing in new start-ups or micro-entrepreneurship…whatever is most important to you and whatever you think can have a multiplier impact for good would count. We don’t keep any of these donations and you choose who/how/where and when to directly donate. If 3% sounds like a lot – remember it doesn’t need to be in a cash donation. You can do it through any combination that adds up to 3% or more – i.e. 2% talent and 1% cash, 2% of product/service and 1% talent, etc. Or if you’re already donating 3% or more – that’s great! We want you to get credit for the good you’re doing by standing with other entrepreneurs proudly bearing the 3% Forward Pledge seal. I’ve always believed one entrepreneur can change the world…now let’s see what happens when we stand together to create a transformative catalyst for what matters most. And July 3, 2012 marks the start of this “revolution” and it continues every 3rd of the month. This entry was posted in Impact, Innovation. Bookmark the permalink. I always thought to “give back” sounded a little shady especially since many only used it to soften customers for the “hard sell” when they oh so magnanimously “offered their money making systems (at a low, low price of course) because they felt that they wanted to give back something. “Paying it forward” sounded much better because it meant sharing your good fortune without trying to bamboozle somebody into buying something from you. Anyway, I commend you and all the others participating in this venture. I myself am only starting out to be an entrepreneur at 61 years of age, with the mission of helping underprivileged children and the aged in my part of Africa, by building a sustainable business on the internet. Wishing you all the best from sunny South Africa. 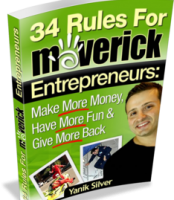 I am reading the first pages of 34 rules of maverick, good reading and I will benefit a lot from it I am sure. Always easy to understand another who knows what they are talking about.. I will read several times to absorb so I say impressed already. I posted a like for the benefit received. Thanks look forward to later emails. Love your take on this concept. I would like to join but the link appears broken. 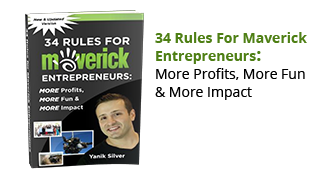 Yanik writes in his blog about these 34 rules and gives you the general outline however in the e-book he expands upon them from his own experiences and real world examples. Packed with over 100 pages with thoughts and personal pictures, it reads greatly for inspiration. Every word is like a keyword itself in a search engine optimized world. You just can’t help but feel the power of how inspired he feels.